"A mighty fortress is our God..." but large, strong walls and substantial towers help too. 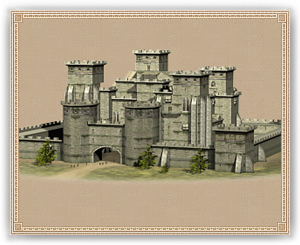 This stronghold is something to make an attacker pause and consider his next move carefully, as taking it will require skill, patience and a good corps of sappers. Meanwhile the defenders will be able to rain destruction down on any enemies, safe behind their immense battlements.